This work, "Best Basketball Dribbling Equipment", is a derivative of "﻿J﻿﻿ohn Wal﻿﻿l﻿﻿" by Keith Allison , used under CC BY. Over the past few years we have seen some exciting new innovations in basketball dribbling equipment. We have searched the vast reaches of the internet to present to you what we consider to be the very best basketball dribbling gear that you can purchase online today. All of the following products have been designed to help you become a better ball handler. If you want to dribble a basketball like a pro then I am sure you will enjoy the selection of ​ball handling gear below. Earning Disclaimer: This post contains affiliate links, which means BallTillWeFall.com earns a small commission if you decide to purchase products through these links. The price is the same for you though. Thanks for your support. ​Smart basketballs such as the popular ​Dribble Up Basketball ​come complete with a quality basketball and connected app that guides you through workouts​ and keeps track of your ball handling progress. Theses ​Sklz Basketball Dribbling Goggles ​force a player to dribble with their head up to survey the court and therefore improve court-vision and reaction time. The ​Dribble Stick provides ​improves hand positioning, stance and speed with the ball. Best yet, it can also be used for plyometric training. ​Basketball gloves such as the popular ​Powerhandz ​challenge the intrinsic muscles of the hand to make you a better ball handler. These ​training bands ​are perfect who want to develop dribble explosiveness and strength. These ​​weighted bballs ​​help develop an explosive dribble and stronger pass. ​Why Should You Consider Investing In Basketball Dribbling EquipmenT? ​Having access to the correct basketball training gear​ can help you take your game to the next level at a faster rate. Let's be honest. We are all time poor. Therefore when we find the time train ​for improvement in out dribbling skills we must train smarter, not necessarily harder. ​​Warning: There are some bogus ball handling products out there that will leave you spinning your wheels. So please avoid them at all cost. Don't worry. We have made it easy for you to locate the best gear to improve your ball handling skills. Below we have compiled a list of legitimate dribble enhancement gear that have all proven to get results on the court. Hopefully you find the list of dribbling specific basketball gear on this page helpful in allowing you to improve your ball handling skills fast. ​Now go break some ankles! The Dribble Up basketball provides one of the most enjoyable ways to improve your ball handling skills. The partnered app acts as your virtual coach and guides you through a series of dribbling workouts. The app then analysis your results and allows you to track your progress over time. 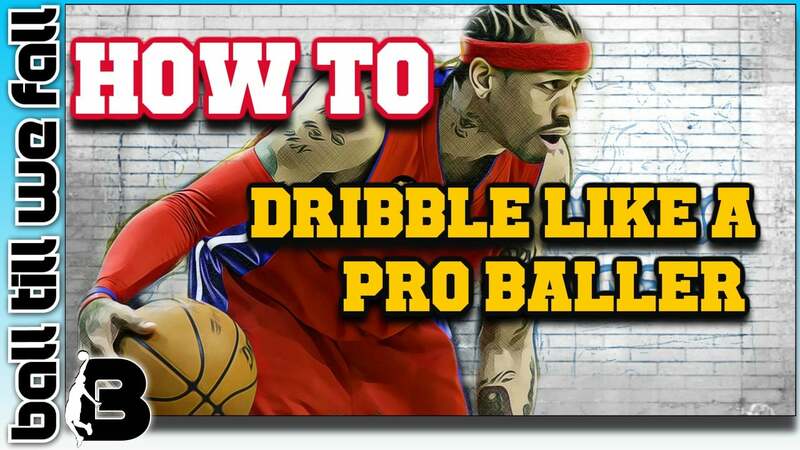 The Dribble Up ball allows you to track a number of dribbling variables. I really love the live audio feedback. The virtual coach helps to keep you motivated day after day. If you are looking to purchase a basketball for dribbling the Dribble Up is the perfect option. You can also check out our reviews of the ﻿best indoor basketbal﻿ls and best outdoor basketballs if you are looking to purchase a new rock. Dribbling Goggles may be one of the strangest pieces of basketball dribbling equipment on this list but they work. These goggles are designed to train players to become better ball handlers without looking down. Sure they look a little goofy but the kids really enjoy wearing them. Wear them often enough and I'm sure you will see improvements in your court vision while handling the ball. The Skllz Dribble Stick is a super innovative piece of basketball dribbling equipment that aims to improve hand positioning, stance and ball speed. Best yet, this device can also be used for plyometric training to help you jump higher. The sticks can be adjusted to a number of different heights and combinations to ensure that you are continuously challenged session after session. There are a range of basketball gloves on the market. Some are very well designed to improve ball handling skills while others are just pure gimmicks. The KBA coach glove is a simple product that eliminates hand and palm dribbling. After wearing these gloves you will begin to establish more efficient ball handling motor control patterns in the muscles of the fingers and thumb. The Naypalm is a similar device that also trains correct dribbling technique by forcing the player to dribble with the finger tips not the palm. The basketball dribbling glove market is dominated by 2 products, Power﻿handz﻿ and Ballhog gloves. These gloves are weighted to strengthen the intrinsic muscles of the hand and also have a non grip surface to challenge ball control. We recently completed a massive review and comparison of the best basketball gloves so be sure to check it out if you are interested in learning more. Utilizing resistance bands while training can be a great way to improve dribble explosiveness and dribble specific muscular endurance. If you want to train with resistance bands you will need a partner to hold the bands. These bands can also be used to help improve vertical jump and general strength. 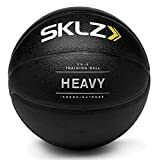 The Skllz Control Basketballs are a weighted basketball that responds like a regular ball. Training with these balls improves hand and forearm strength, speed and endurance. Every basketball player should strive to have as strong hands as possible as hand strength is directly correlated to better ball handling, shooting and passing. Stronger hands can make it also easier for you to palm the ball which is handy if you want to learn how to dunk. The Ball Hog Hand Strengthener is a simple device that you can carry around with you anywhere you go. Perfect for the classroom! We hope you have enjoyed our collection of what we consider to be some of the best basketball dribbling equipment available to purchase online. 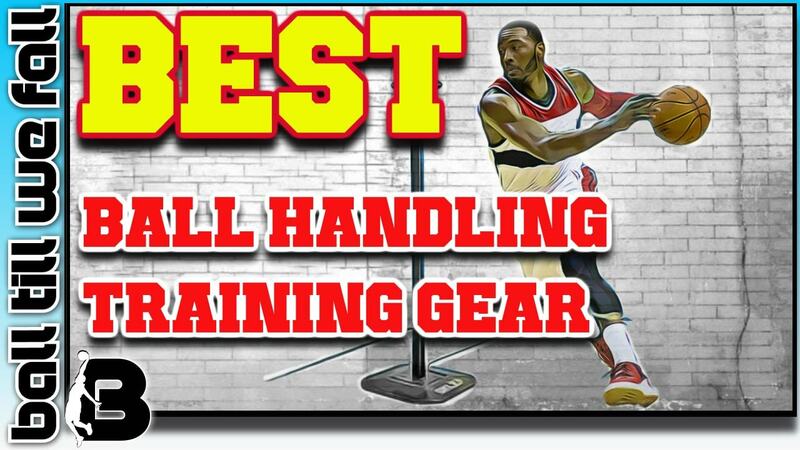 if you have tried any of this equipment or have any suggestions on any other ball handling enhancing products that you have encountered please comment below. We aim to update this page regularly with the latest and greatest basketball dribbling equipment so be sure to visit us again in the future. Also don't forget to check out our reviews and comparisons of a ﻿﻿huge﻿﻿ range of the most popular basketball gear around the world.